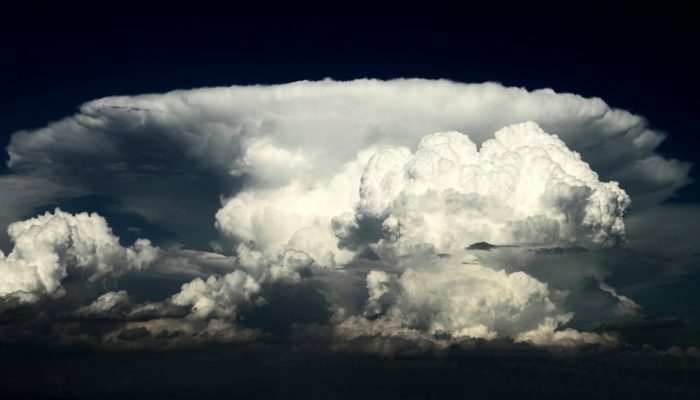 This wonderful mature thunderstorm cell was observed near the German Aerospace Center (DLR) Oberpfaffenhofen. A distinct anvil can be seen in the background meanwhile a new storm cell is growing in the foreground of the cumulonimbus structure. Mature storm cells like this are common in Southern Germany during the summer season. Strong heat, enough moisture, and a labile stratification of the atmosphere enables the development of this exciting weather phenomenon. Description by Martin Köhler, as it first appeared on imaggeo.egu.eu.